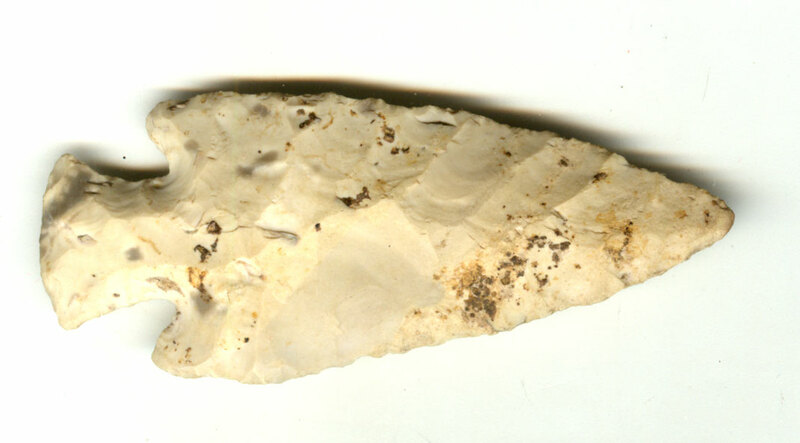 A Large Size, Thin, Visibly Aged And Anciently Use Sharpened, Well Made Ocala Point That Exhibits Surface Sheen And Stone Aging Coloration Patination, Aging In The Corner Notches, Correct Rolled Basal Stem Edge Hafting Dulling, Heavy Aged Surface Deposits, Correct Blade Sharpening Use Reduction, Correct Early Style Blade Flaking, Correct Material And Manufacture For The Area Found. Ex-R.W. Lyerly, Danny Bowen And Dub Johnson Collections. This Rare, North Arkansas Type Is In Very Good Condition, Described In Gregory Perino's, Vol. I, "Selected Preforms, Points And Knives", On Page 277. Includes A Roy/Karen Motley Certificate On 3/11/2003, ( As A Hardin Point ) And Ken Partain Certificate As An Ocala Point ).